on Tuesday 20th March 2018 in Marple Library. Light refreshments will be served from 2.40pm prior to the business meeting at 3-00pm. We will then welcome our speaker Paul Hartley. Paul has been a conservation officer with Stockport MBC for many years. When other councils dispensed with their conservation officers due to cut backs, Stockport Council had the good sense not to follow suit. 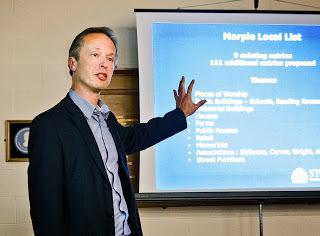 Paul is known to many in Marple due to his involvement in our abundant heritage. He has spoken at Civic Society meetings in the past on Local Listings and the Oldknow's Legacy project. This time we have asked him to concentrate on conservation in general, including conservation appraisals and other conservation protection that might help us to better care for Marple. Can we extend conservation areas or create new ones for example? Come along to find out more and ask questions of our conservation officer. We hope to see you at the meeting - family, friends and neighbours are welcome too (N.B. only members can vote for election of officers and committee members). - Planning workshops - Get your own back: be a thorn in the side of the planners! On 7th February the civic society took part in a Civic Voice event as part of the "First World War Memorials Programme". The event was held at Stockport War Memorial Art Gallery, believed to be the only purpose built war memorial art gallery in the world. The event heard from a variety of volunteers engaged in the WW1 Memorials Programme who reviewed their work over the past few years and considered the future protection of war memorials in England. The society's presentation included how we became involved, local groups who supported the project, how we carried out the survey and what was achieved. For the record, 32 memorials were listed on the national database and four freestanding memorials were recommended as eligible for national grade II listing.